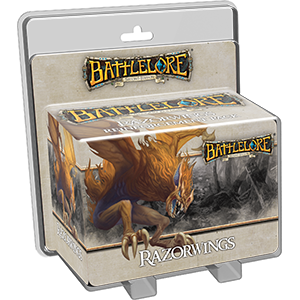 Hunt your opponents from above with the Razorwings Reinforcement Pack for BattleLore Second Edition. These bloodthirsty predators swoop down from their cavernous lair, soar over the battlefield in search of prey, and descend swiftly to brutally slash and tear their victims apart. This Reinforcement Pack contains three sculpted plastic Razorwing figures, the cards necessary to muster your Razorwings unit, three new lore cards, and a unique cavern terrain tile. It also features a pre-built scenario, A Shot in the Dark, in which the Daqan forces must traverse hostile territory, fighting against both the Uthuk Y’llan and the ravenous Razorwings in the black of night. Whether you use the Razorwings in this scenario or harness them in other battles, their savage and sudden assaults bring new tactical possibilities and fresh terrors to your games of BattleLore.